In 2018, while most cryptocurrencies were crashing, a few were living quite healthily, in unexpected notoriety. Dozens of new stablecoins joined the market last year; a solution to many crypto businesses’ needs, but a point of controversy for quite a few pundits. In this introductory article, we discuss the uses of stablecoins in crypto businesses, their classifications, advantages and weaknesses, and how stablecoin holders profit from them. Plus, a detailed description of the most popular ones. Stablecoins are blockchain-based currencies that mirror the price of a specific fiat currency as closely as possible. This (in theory) makes their prices very stable compared to the rest of the crypto market and allows traders to represent fiat values without all the delays and regulatory scrutiny of real fiat. What are stablecoins used for in the crypto world? As a product, they mostly cater to crypto businesses, who often need a way of trading fiat but do not wish to deal with government regulations nor the wait times involved in fiat transfers. Think of cryptocurrency exchanges, cross-border payment services, supply chains, remittances, and commerce. There's no room for the drastic volatility of regular cryptos in these areas. Stablecoins are also useful as a way to lock in your gains from crypto trading, or as a safe harbor for investors when a crash approaches. So stablecoins are a good tool to have around. But what, if any, is the financial incentive to create them? Contrary to intuition, stablecoin issuers and market makers can and do profit from these fiat-pegged cryptos. Stablecoins may appear unexciting. There are no mining fees to collect and no speculation to be made since their prices are designed to remain, well, stable. However, though stablecoin creators and holders cannot make money off them in the traditional crypto way (through mining or saving some coins and cashing out when they moon), they do profit in other ways. As Todd Clyde, COO of a financial compliance company called Token, told Decrypt last year, “the value’s not in the coin, it’s in the company.” Basically, stablecoin issuers are just trying not to lose too much money while they play the long game: attracting VCs and new customers to their main business through stablecoin-related services like cross-border payments. In other words, stablecoins bring added value to companies and help raise awareness about their other products. Market makers, big time holders who inject liquidity into the markets, are the other winners when it comes to stablecoins. Cryptocurrency exchanges and stablecoin issuers pay them to distribute their tokens, and they also profit from buying below the dollar and selling above it (though stablecoins do not fluctuate much, as established). Holders who want to profit can do so, but you will be restricted to just watching the markets carefully, and trading. Certain tokens, like the DAI, are designed in such a way that makes trading for profit easier. Holders can also earn interest by loaning digital assets; for example, TrueUSD offers its holders up to 8% annualized returns. Cash-collateralized: these stablecoins are issued by a private company who claims each one is backed by real fiat in their own bank accounts. A major disadvantage is that these coins are centralized. Examples are Tether, Gemini, PAX, and True USD. 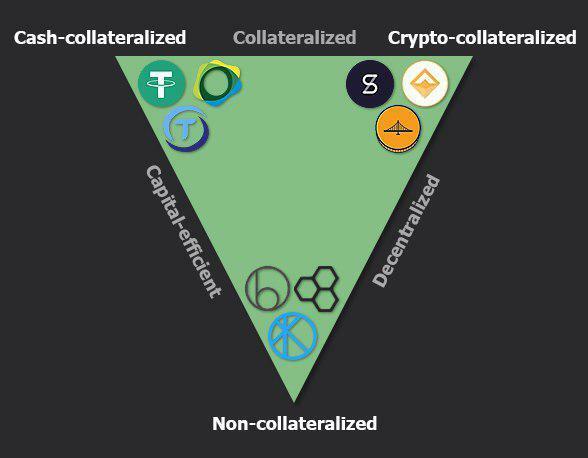 Crypto-collateralized: instead of being backed by fiat, these stablecoins are backed by other digital assets, eliminating the need for a trusted third party. On the downside, they can suffer a greater risk of volatility. Examples are DAI (by Maker DAO), Havven, Augmint, and Sweetbridge. Non-collateralized: these coins are not backed by anything; they rely on seigniorage shares, a system in which a smart contract acts as a central bank of sorts, whose sole monetary policy is to mint new coins if the price goes too high, and burn coins if the price falls too low. Examples are the failed Basis project, Kowala, Fragments, and Carbon. 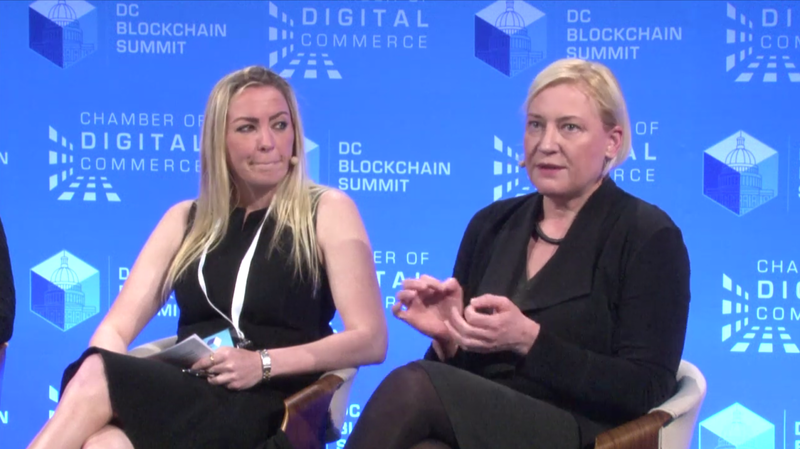 It is worth noting that the SEC’s Senior Advisor for Digital Assets, Valerie Szczepanik — a.k.a. the Crypto Czar — proposed a slightly different (and still unofficial) classification, adding a separate category for stablecoins backed by resources like gold or oil. You’ll find the full report, including her views on whether stablecoins are securities (in a nutshell, it’s a case-by-case situation), here. Next, you will find descriptions of the most popular stablecoins. The company Tether Limited first issued Tether in 2015, hoping to tap into the market of crypto exchanges and crypto businesses that did not want to deal with the complications associated with fiat. Tether is quite a controversial coin, mostly owing to the difficulty the company has had in reassuring the public that they do in fact possess enough funds in fiat to back all their tokens. For years, Tether has avoided an audit that would prove it has the funds to back its tokens. 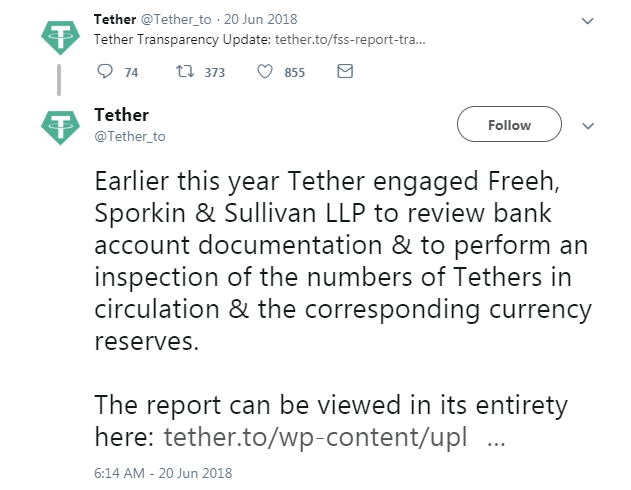 In 2017, Tether Ltd. hired Friedman LLP to issue an audit, but terminated their service before the report was published. Fueled by suspicions of fraud, the U.S. Commodity Futures Trading Commission (CFTC) subpoenaed Tether Ltd. and Bitfinex (who shares the same CEO, J.L. van der Velde) in December 2017. In June 2018, finance professor John Griffins and student Amin Shams published findings that Tether price manipulation via Bitfinex might be responsible for as much as half of Bitcoin’s 2017 gains (reported Bloomberg). Van der Velde denied these allegations (view post here), but the findings spurred an investigation by the U.S. Justice Department, who is looking into Tether Ltd.’s coin minting mechanism and why they enter the market predominantly through Bitfinex (read more on this subject here). Tether Ltd. did release a transparency report in June 2018 (here), in which the FSS, a Washington-based law firm, claimed the company possessed enough funds to back every USDT one to one. However, what the FSS ran was an inspection, not an audit, and suspicion has remained high. In its lifetime, Tether has been dropped by Wells Fargo and by Noble Bank. In December 2018, Bloomberg reported they had accessed bank statements “provided by someone with access to the company’s records” and confirmed by a government official, that would show that Tether Ltd. does, in fact, hold enough USD; but which do not show where these funds originated or where they are now. Since its inception, Tether coin had remained almost exactly on the dollar (except for a 3-day-long dip to $0.96 in August 2016) up until April 2017, when it dramatically sunk to $0.915. From that point on, its trajectory has resembled that of other stablecoins; always hovering very close to the dollar, but never staying long on it. USDT hit its historical high peak at $1.15 on May 27 and has tended to stay slightly above the dollar ever since, with the notable exception of the “attack on Tether” in Oct. 2018 and another low in Nov. 2018. On Oct 15, 2018, Tether (USDT) suddenly dropped from $2.8B to $2.0B. According to analyst Henry He, founder of Open Sesame protocol and ex-Google employee, Tether suffered a sudden coin dump — rumored to have been orchestrated by IMMO, a group related to the Rothschild dynasty — meant to drive its price down and the rest of the crypto market up. Find his full article on his Medium page, here. Since the attack, Tether’s lowest price was $0.945 on Nov. 4, and its highest was $1.03 on Dec. 29, 2018. At press time, Tether is trading at $1.01, a 0.87% gain on the day. First issued by UC Berkley-based startup, TrustToken, in January 2018, the TUSD is pegged to the US dollar, but tries to improve on the drawbacks of Tether. When users buy TUSD, their dollars are kept in several escrow accounts and trust banks that have partnered with TrustToken. Later, when holders turn their TUSD into the exchange and get their dollars back, the coins are destroyed. Something important that sets TrueUSD apart from Tether is that TrustToken actually releases monthly reports on its reserves, audited by Cohen and Co. You can find the full TrueUSD attestation reports here. In theory, the company never touches people’s money, since it goes straight into escrow. TrustToken is planning more tokens, such as TrueEuro and TrueBond. A True GBP was released on Apr. 2, 2019. In its existence, TUSD has mostly moved between the dollar and $1.02 (its lowest ever was $0.98 in July). This rule is broken by just two notable exceptions, both in 2018; the TUSD hit $1.36 on May 16, right after it was announced it would trade on Binance, and $1.10 on Oct 15 — the same day as the attack on USDT. At press time, TUSD is valued at $0.99, a 0.96% loss on the day. DAI coin was created in 2017 as the first decentralized stablecoin issued on the Ethereum blockchain. DAI is crypto-collateralized: one DAI equals $1, not because a third party has promised to hold a dollar for each DAI token, but because a smart contract holds a portfolio of digital assets (most commonly ETH) as collateral for each DAI purchased. The advantage of DAI compared to the other coins discussed is that it is decentralized. Users deposit collateral into the Maker DAO platform and receive DAI in exchange. When the borrower pays back the debt (along with a stability fee), the collateral is released back to them and the DAI are destroyed. Think of Maker DAO as a decentralized bank who’s giving you a loan in DAI. Since the smart contract always assumes that a DAI is worth $1 (no matter its market value), if the price of DAI goes down, it’ll be cheaper to pay back your loan. On the other hand, if the price of DAI goes up, it could be a good time to get a DAI loan and quickly exchange it for some other crypto or fiat. 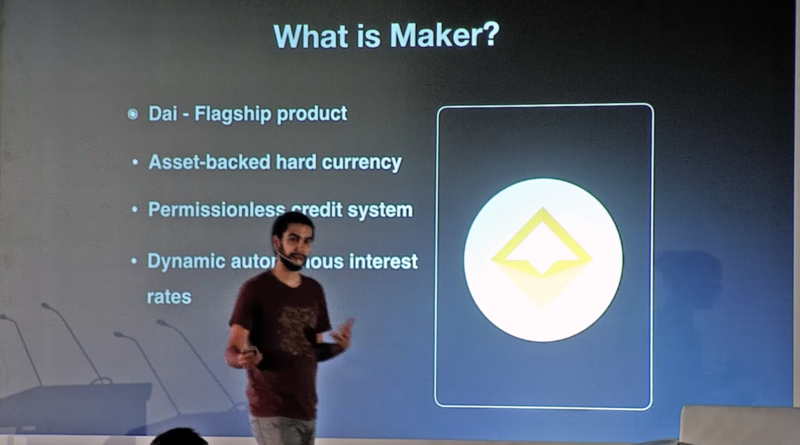 Maker DAO also has a governance token, MKR, which gives its holders voting power. In good times, stability fees from the platform are used to buy back MKR, increasing its price; in times of volatility, more MKR are minted to stabilize the DAI, which decreases the Maker token’s price. For more information, we recommend this series of videos made by the DAI Foundation. A disadvantage of DAI is its complexity. Preston Byrne, vocal detractor of stablecoins, argues that the structure of Maker DAO is convoluted by design, so that buyers won’t realize “the contract is massively overcollateralized in the underlying Ethereum and, in the event of an Ethereum black swan event the value of the underlying collateral, and therefore the value of the stablecoin, will also be wiped out.” You can check out the rest of Byrne’s article here. For most of its history, DAI has moved between $0.97 and $1.03, with only three exceptions. The coin hit $0.93 and then $1.05 just 17 days apart during January 2018 (keep in mind this was its first month of existence). The last case of strong deviation was just days ago, on Mar. 30, when DAI sunk to $0.959. At press time, the DAI is slightly high, at $1.01, a 2% gain on the day. Any asset pegged to another is tied to the latter’s health; if ETH crashes, so does DAI, and should the U.S. dollar fluctuate violently (a less likely scenario), Tether, TrueUSD, and many more would go with it. When it comes to cash-collateralized assets, there’s the normal risk associated with trusting third parties; what if the company’s cash reserves don’t exist? In this sense, you may feel safer with coins who’s companies issue regular transparency reports, like TrueToken or the Winklevoss’s Gemini Dollar. Then there’s the presence of regulatory bodies, like the U.S. SEC. In December 2018, Basis, a non-collateralized stablecoin that had raised $133 million was forced to close down and return the money after the regulatory guidance it received made it clear it could not escape being classified as a security under U.S. law. Finally, there’s price attacks, or secondary market manipulation. Analyst Henry He has been following developments in this area since the attack on Tether in October 2018, and has warned that there will be more attacks on stablecions in the future. Final thoughts: are stablecoins a good idea? One of Preston’s arguments, that Maker DAO has built a perpetual motion machine, is actually not refuted by the team. Byrne embodies much of the criticism that stablecoins have received – that they ignore basic economic principles, that they only exist for market makers and companies to make money off of them, and that they are extremely vulnerable to manipulation. Users should read into all these warnings before deciding to use stablecoins; but of course, that piece of advice goes for all cryptos in general. Then there’s the subject of centralization, which underlies many popular stablecoins. Some feel that taking crypto back to centralization and reliance on banks is blasphemy, while others may shrug and take the convenience that stablecoins offer. In the end, Byrne concludes, stablecoins collateralized by themselves are fragile machines doomed to fail, and stablecoins collateralized by real assets are “not a stablecoin, but a unit trust.” We can ask ourselves here, what’s in a name? If it’s the case that stablecoins are just units of trust, let’s just change the wording of the question: are tokenized, centralized units of trust something that we want or need in crypto?